Whichever it was, the Bakery Baking Today* sign at the Farina turn-off in the middle of the South Australian Outback just HAD to be too good to be true. Because over 600km (370+ miles) north of Adelaide, the last stretch of continuous bitumen for several hundred kilometres had receded into the middle distance behind us to the south. We’d already passed the beginning of the tyre-shredding Strzelecki track, a notorious stretch of dirt through the Strzelecki desert connecting tiny Lyndhurst with Innamincka, 469 km (291 miles) to the north east. And now, we were travelling north towards Marree, a remote outpost at the southern edge of the Lake Eyre basin and home of legendary Outback mailman Tom Kruse. Yes, that’s his real name. From Marree, the only way out was either east along the Oodnadatta track, a 607 km (377 miles) dirt track through the remote Outback that joined the Stuart Highway at Marla; or the fabled Birdsville track to – you guessed it – Birdsville, 519 km (322 miles) further north. Yes, we were on the outskirts of Australia’s Boys Own Adventureland. A 4WD and/or motorcyclists’ heaven traversed by groups of three (WHY ALWAYS THREE???) blokes – and we would, for the first time, visit the start of each of these iconic tracks in one day. Now, en route to Marree, Farina was a ghost town full of ruins. The white marquee rising incongruously above the partially restored stonework of the Farina ruins in the distance suggested otherwise. As did the banner indicating South Aussie icon Laucke Flour’s personal interest in this little bakery in the middle of nowhere. Clearly, further investigation was required, so I turned to Pilchard – but the car had already swerved towards the turn-off. No bakery-seeking-sensor required in THIS car!! As we drew closer to the knot of vehicles gathered around the cluster of old buildings surrounding the marquee, the smell of freshly baking bread gave the game away. Martin, Farina Bakery Baker extraordinaire! Yes, there really WAS a fully functional bakery in this remote ruin. And judging by the roaring trade being done with the constant arrival of incredulous visitors from both north and south, a Back-of-Beyond Bakery was just what the doctor ordered. In a masterstroke so civilised it should be made mandatory, the underground Bakery was the first building to be restored to full working order by the Farina Restoration Group Inc (FRG). Ironic, given that Farina is, of course, the Latin word for flour. And the town was so named in expectation of it becoming the ‘Granary of the North’. Sadly, the unpredictable climate, remote location and lack of water ultimately meant its decline, despite its one-time position as the railway head for all northern lines. But in one of those undeniably symmetric coincidences, Farina is finally living up to its name, with the Bakery (open for a few weeks every year in May/June/July). It’s now a focus for fund-raising, publicity and – of course – a completely unexpected opportunity for an excellent Back-of-Beyond Bakery pig-out. This was one of those times that sacrificing myself for the sake of my blog became not just a duty, but a pleasure**! Bron and Syd, volunteers from FRG that keeps the Bakery operational for a few weeks in May, June and July, expertly fielded queries, served customers and – in my case – mopped up the coffee I overturned in the excitement of finding this bizarre bakery. All while posing for photos! The FRG, now about 5 years old, was founded by Tom Harding who with current station owners Kevin and Anne Dawes, saw Farina’s potential as an historic site and set about restoring it as a tourist attraction. Apart from partnerships with various organisations and professional stonemasonry, all work is done by volunteers – to volunteer in 2017, use the Farina Restoration Group on-line form HERE! Those who are planning a similar venture should not underestimate the effectiveness of the Bakery drawcard! Word of mouth is already working its magic as winter’s onset signals the start of the Outback Adventure season and all sensible travellers head north for warmth. Of course it helps that Farina station has also set up an excellent campground with barbecues, fire pits, toilets (look out for one of them in MY BOOK!) and hot showers, all for $5 per person per night. It’s an excellent staging post en route to the rough stuff of the tracks further north. But it’s an attraction in its own right with walks along the river and no-longer-used railway tracks, and story boards detailing the history of the town’s rise, fall and restoration. The Group’s volunteers stay on site in the campground for the annual restoration activities while the bakery opens for about 8 weeks between May and July – some are reportedly the bakery’s best customers – and work on a roster system to ensure the bakery stays open. I almost joined up on the spot! Of course it also helps that the Bakery goods are absolutely top shelf. The old Scotch oven in the underground kitchen turns out an astonishing array of sweet, savoury and plain bread rolls, sausage rolls, individual and family sized pasties. Martin, the baker du jour, dexterously whipped trays of superbly baked goods out of the oven while telling us he’d co-opted a few of his baker buddies to volunteer for a stint at Farina. ‘Well, they USED to be my friends,’ he laughed, while proving – at least to MY satisfaction – that 80 years of disuse didn’t seem to have affected the oven’s effectiveness. The oven’s underground location probably also helped to preserve it. One of the many storyboards produced by the FRG around the ruins mentions the destruction of outside dunnies in violent storms … which means no Scenic Public Toilet pic from the Farina ruins. But there IS an awesome one from the picnic ground in my book Aussie Loos with Views! One of the Driest Places on Earth! After a particularly dry summer and autumn, driving to and from Farina across the arid lands of the South Australian Outback – driest part of the driest state in the driest continent on earth – there’s no mistaking the hardships faced by the early settlers in towns like Farina where today’s green and fertile pastoral country could be tomorrow’s dust bowl. But the FRG’s hardy bunch of volunteers are putting Farina back on the map for a few weeks every year by offering their unique Bakery at the Back-of-Beyond experience! And that puts it well and truly on the map for THIS Aussie traveller! STOP PRESS: The bakery will be open in 2019 from Saturday, 25th May to Sunday 21st July 2019! BE THERE! * PLEASE NOTE: The Bakery is only open for a few weeks in May/June/July. Aussie ABC – F is for Fossils! The bakery will be operating from Saturday 25th May 2019 to Sunday 21st July 2019, Wayne & Debra! I’m sure the Farina restoration group would love to hear from you – please contact them direct on their official website HERE: https://farinarestoration.com/ – they also have a contact form on their website HERE: https://farinarestoration.com/contact-us/. I hope you have a good time!! This is so cool and totally unexpected. I would not have thought that you can find a bakery in this area. It looks like there are only a few people who go here. However, it is part of the charm. The loaves of bread must be delicious and freshly-baked always. This is really nice to boost tourism in the area. And all the better for being unexpected, Ladyfi!!! Despite Pilch and Red abandoning me to face Farina solo this year, I gathered a few Expore SA members and did a day trip from Leigh Creek/Copley Caravan Parks to Farina. We arrived early enough to have a full range of goodies on offer so we tucked into those before exploring. Priorities are most important. This time I went out to the isolated cemetery and spent more time in and around the campground and the recently-established ANZAC Memorial Hill precinct. Another three of our Explorers camped in the Farina Campground and spent several superb nights and days there and came away enthusing about the whole Farina experience. I’m SO jealous, Gawain! So glad you enjoyed your 2nd Farina experience – I bet you’re already gearing up for a repeat performance next year?? There are so many aspects of Farina to explore, and it’s good to see South Australians (and others) supporting Leigh Creek and Copley. I know I really enjoyed staying in Copley last year – it makes a great base from which to explore the region. But I thought you were going to camp at Farina??? Absolutely spot on Red! This year I’m gathering our Explore SA members and we’re Farina-bound in June fully intending to camp at the campground so we can be at the doors each morning when the bakery opens. Breakfast at the bakery in The Outback. Heaven in a heat haze……..
@Ciara – It sure was a surprise!! The bakery runs for ~6 weeks each year during May & June depending on volunteer availability. SO glad it filled that gap when WE were there!! @Felicity – Thank you so much!! It was SUCH a find I just couldn’t help sharing!! a brilliant story and wonderful photos!! What a great find Red! Who’d have thought to see a Bakery in the middle of nowhere. Talk about filling a gap in the market! How often is the bakery in operation? @George – The even stranger thing is that a lot of our finds are coincidental!! Maybe there really IS a built in bakery sensor! @Carole – It’s things like these that make travel worthwhile!!! @TOB – I take my hat off to the FRG – but it’s a shame that preserving much of our heritage will be left to volunteers. @LONDONLULU – Outside the 6 weeks and a bit more of winter, I imagine the climate is pretty fearsome! @TMWH – It’s the BEST way to encourage tourism!!! @GL – There are walks along the railbeds of BOTH gauges at Farina! Dare I say a train buff’s fantasy???!!! @Jill – Thank you, my friend! I’ll be interested to read about your perspective on some of the places I’ve visited! @Sallie – Surprise, joy AND extreme outback fantasy! @Hilda – ESPECIALLY in the middle of nowhere where it is SO unexpected!! @Mary – Hahaha, so I’m NOT a politician then!!! I’m not familiar with Farina, but if it has anything to with bakeries, I’m SO going to find out! @Saucy Kod – Would you believe it was a total coincidence?? We wanted to check out Farina, but had NO IDEA there was an operational bakery there!! Weird, huh?! @Andrew – HAhaha, or a skinny bakery aficionado (sp?)! Sorry about your other comment, but this one suits me just fine!!!! @TFG – While Red Dog was shot several thousand kilometres away, the Outback is the Outback is the Outback!!!! @Dianne – If I wasn’t already wearing glasses AND wasn’t out in the middle of nowhere, I’d have got my eyes tested like a shot! @Linley – If I’ve inspired some Aussie travel, then my work is done!! Get to it, girlfriend!! @eileeninmd – I wouldn’t kid about anything as serious as a BAKERY!!!!! At least when you digress you are interesting about it. But now I want that comfort food Mom used to make me: Farina. Bizarre, indeed. But what a fantastic idea! I will never be able to resist the smell of baking or freshly baked bread even if it was in the middle of nowhere. Yumm. What a surprise and what a joy to stumble across this. Neat history of the area. you have done it again Red – given me yet another place to add to my list to visit when we tour through SA later this year. Unfortunately though we will not be in time for the bakery! How unique and so delicious sounding! I would have loved to have been there when they were baking. Thanks Red for bringing new places to us in your usual informative and hugely readable and enjoyable style. Well! A delicious treat to follow a long hard drive through the wilderness? That is one way to encourage tourism! I loved the picture of the rail bridge! That’s a sad reminder of the once mighty narrow gauge, original Ghan line when a trip to Alice Springs might take a week or more if the line was flooded, blown away, trains broke down or camels parked themselves on the rails. What a find! These ‘ghost town’ spots are so fascinating to me, and I’m so impressed (and intrigued) by people who find a way to hunker down there. I used to stay at the Patterson house as a child growing up in Leigh Creek. It was always a good place to camp as a teenager as well. It is good to see Farina’s rich history won’t be forgotten. Farina’s story is fascinating and it’s good of you to share it with us. The bakery sounds wonderful, and I must say you find some of the most exotic places to visit. Your photos reminds me of an Australian film we just saw called Big Red Dog. Wonderful movie. Have you seen it? Fresh baked bread is always worth a drive. Thanks for your post. Wow, what an amazing find. I thought you were kidding until I saw the loaf of bread. Cool post! Fantastic post Red, what an amazing find. I now have another place on my to do list. I am getting itchy feet, I need to start travelling again. I can imagine your delight Red at finding a working bakery way out there in the sticks ….. a real gem in the desert. What a find. I don’t know how you manage to sniff out these amazing places in the back and beyond! 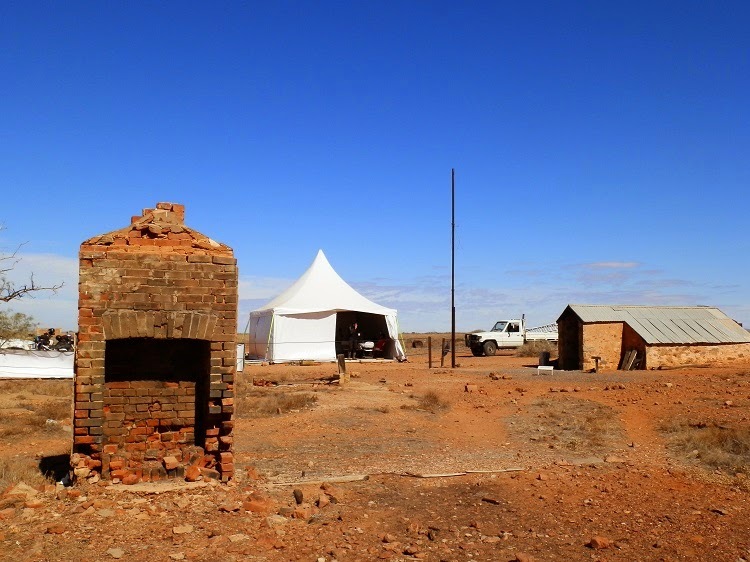 Great blog, having been past Farina and camped in the creek on several trips to Birdsville and beyond I read your report with interest and a taste for a freshly baked bun. Will definitely drop in when passing Farina again. Seems like a long way to go for a loaf of bread but then how do you put a price on preserving history. Another crumb of brilliance in your rich and over flowing story cupboard. My most brilliant and challenging comment has gone to god, aka the ethernet. However, never trust a skinny baker, and you didn’t, as per Michael. I loved this post – Boy, Red, you sure know how to pick em. How is it that you always find the neatest bakeries. Share a hunk of that bread, eh. Great photo of the rail bed bridge, also, nice photo of you n P descending into the depths. Boy, you really do get to the remote stuff – how do you ever find them. Great info. @Geoff & Hels – Thank you!! We’ve yet to make it to Birdsville, but when we do, we’ll just have to make sure our route takes us back to Farina!! @FruitCake – Hahaha, I thought everyone would think I was making it up! Farina now has a LOT of appeal!! @Fun60 – HHHMMMmmm… I’m thinking it looks SO different to NY!!! But I bet the bakery goods are better!!! Is it really more than 5 years since I saw Farina? Trust you to sniff out a bakery in the middle of nowhere, Red. An amazing place and story – thanks for taking me back. That’s amazing. Having been to Farina when the bakery was not operating I really did think you were pulling my leg with the title of your post.